Keep your financial data secure and your applications up-to-date. An estimated 50% of SMBs have experienced a cybersecurity breach in the past 12 months. In the financial sector, security and accessibility of data is integral to success. Managing and protecting your files and applications internally is an expensive and time consuming task. Mistakes can have a critical effect on your clients, your reputation, and the future of your business. You don’t have to face this challenge on your own. 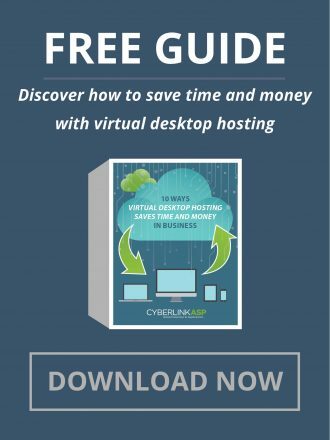 Virtual desktop hosting gives financial organizations a way to keep all their files and applications off of vulnerable laptops and in a secure centralized location that’s accessible to employees on any device. When you partner with Cyberlink for your managed IT infrastructure, we manage your hardware so you never have to worry about setting up or maintaining your servers. You will never have to update your operating systems or applications again. With Cyberlink, your data and applications are hosted in a secure Tier 4 data center. You will also have access to a team of experienced technicians who will coordinate updates and monitor network security 24 hours a day, 7 days a week, 365 days a year no matter where you are. We make sure that you are operating with 100% uptime. Cyberlink keeps our servers completely up to date and compliant with all international financial directives and regulations. We protect you against threats and monitor activity for optimal safety and immediate response time in case of a concern. Give your team safe, remote, access to everything they need to stay on task and not miss deadlines. Virtualization is ideal for promoting a collaborative work environment for your team from anywhere at any time. We provide regularly scheduled backups so you don’t have to worry about data loss. Managed IT means fast, secure access to your information and 24/7 support. Cybersecurity is one of the most significant and potentially dangerous risk areas facing financial institutions. As federal and state regulators continue to add new regulations, many institutions are struggling to create and maintain an effective cybersecurity risk management policy or program. To manage cybersecurity risk, companies must start by anticipating and preparing for the danger. CyberlinkASP provides you with the security required to maintain compliance and constantly monitors to identify potential threats and breaches to save time and reduce potential damage. Consumer confidence is vital to the success of your business. The rising number of data breach incidents results in increasing concerns over the risks associated with unauthorized disclosure of personal information. Continuous investment in security systems and processes is necessary to stay on top of potential threats. Otherwise, you are leaving customer data vulnerable to attack. Managed IT takes the worry out of this equation as they have expert knowledge and experience to help you keep private information private. During mergers and acquisitions transitions can be a nightmare. Keeping everything running smoothly as you combine systems, make changes and help users get accustomed to new processes is a huge undertaking. Using managed IT can streamline the integration process while maintaining security and compliance. Coupled with around-the-clock support, CyberlinkASP ensures a smooth IT merger so you can focus on your business.